Speaking on new/old products appearing on store shelves, Pepsi is releasing two new soda lines: Pepsi Natural and Pepsi Throwback. Their main selling point is that they are made with real cane sugar instead of high fructose corn syrup. According to Reuters.com: “Pepsi Natural, a premium cola made with sugar, natural caramel and kola nut extract, will be sold in glass bottles…The Pepsi and Mountain Dew Throwback drinks will be sweetened with natural sugar and will feature retro-looking packaging reminiscent of the 1960’s and 70s.” . My Dad used to rant and rave that Coca-Cola in glass bottles was better than Coke in cans, and fell into a deep depression when they discontinued the glass bottles. After moving to New York, I brought my dad home a few bottles of Coke from the Mexican deli across the street, and I discovered the difference: imported Coke in bottles is made from real sugar; American soda (or pop, for my friends in the midwest) is made with HFCS. Besides, People are really excited about that glass bottle. 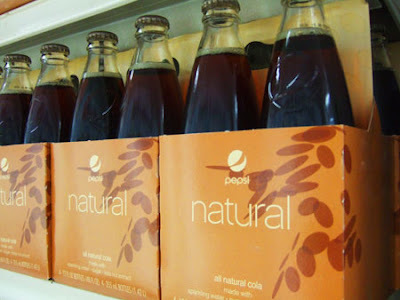 I recently saw Pepsi Natural on the shelves of my local Duane Reade; I haven’t tried any yet, so if you have, let me know what you think. And on the topic of tasty sodas, if you live in New York, The Lexington Avenue Candy Shop is worth a visit. More of a luncheonette than a candy shop, they make all of their sodas the old-fashioned way, with syrup and soda water. They also don’t have that whole “we an old fashioned soda shop!! !” attitude. I had never had a “real” root beer float before, and it was unbelievable.